I don't knw this stroller...but the front wheel thingy is awesome! My new grandsons stroller is like this and so easy to maneuver and push! Just for the record...he has a human baby stroller...NOT a doggy stroller! I like it and I want one. As long as you only have one bulldog and your bulldog fits and is under 60 lbs. it looks great. I have the Pet Gear Expedition Pet Stroller (you can get it online from walmart) and I can't say enough good things about it! It's low to the ground so Princess (10) can get in and out very easily, I usually place her front paws in the stroller then help her push herself up. I take her for walks and when it's time for her to do her business she hops out, with my help, and comes waddling back to her stroller excited to go back in! She has so much space in it to stand, sit, or lay down if she wanted. I use this stroller on sidewalks/streets and even smooth dirt paths around a pond in my town. Thanks, Melissa. I'll check into that one too. I just ordered our stroller. I went with @mcraven2 and her recommendation. I got it from Amazon and saved a lot of money--plus plus free shipping! @ChrisRN Awesome! I can't wait to see pics of Mabel in her new wheels ! This stroller is really great, and the setup was pretty easy but it took me a few tries to figure out the back wheels, but once I got it it was super easy so let me know if you have a question on the setup! 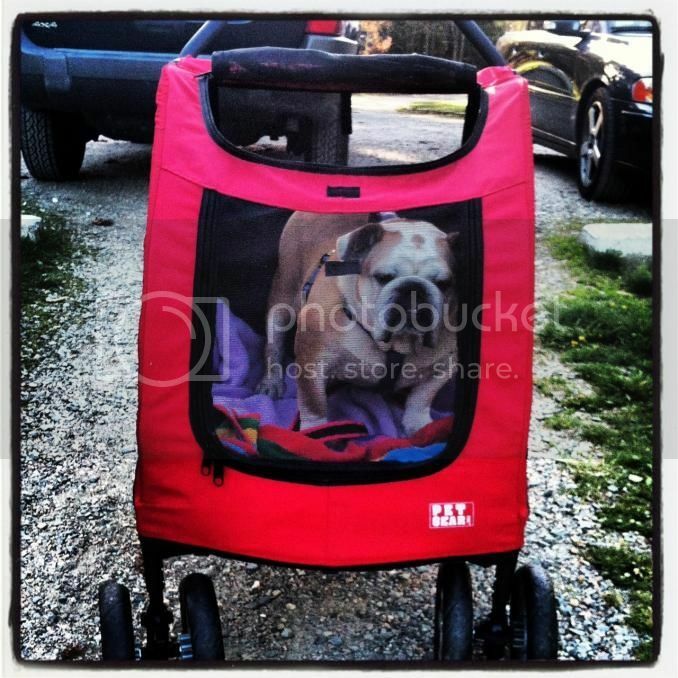 Princess looks adorabull in her stroller!! This is the one I'd love to get some day. I've tried to put HRH on a garden cart and she was having no part of that. For her first strolling experience I think we would need something she can't jump out of. @LariP, I got it from Amazon for $169 and free shipping. It will be delivered next week. We'll see how she does!